Judge’s Irish Pub. Photo taken September 30th, 2008 by Jeramey Jannene. The City Plan Commission advanced a proposal to redevelop the site of the former Judge’s Irish Pub into apartments on Milwaukee’s Lower East Side. Developer Kalan Haywood and his firm, the Vangard Group, are planning to redevelop two properties into a five-story, 44-unit apartment building. The commission unanimously approved rezoning a property at 2215 N. Cambridge Ave. so that the duplex there and the former tavern at 1431 E. North Ave. can be combined into one 21,424 square-foot development site. 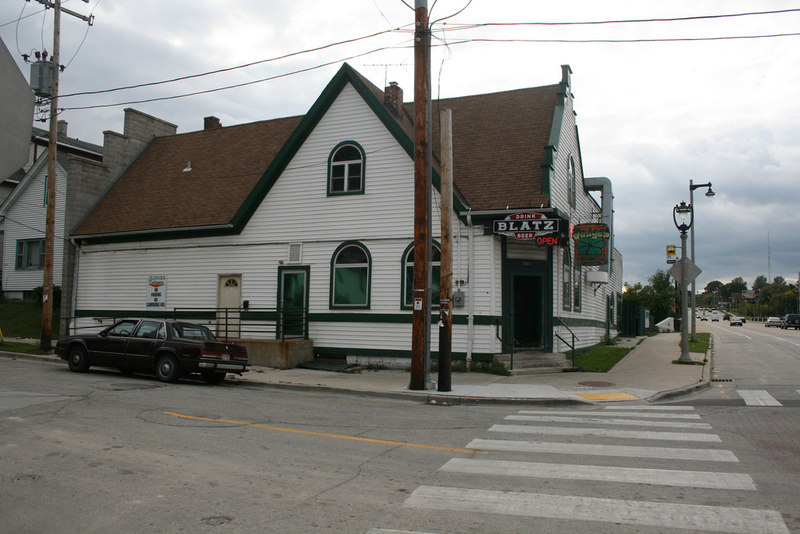 The tavern building dates back to 1909 according to city records. The duplex is even older, having been built in 1890, the records show. Neither property has been designated historic by the city. Both would be demolished for the new apartment building. The tavern site is currently zoned LB3, which allows for a building between 30 feet and 75 feet in height. The 6,000 square-foot duplex lot would be rezoned from multi-family residential, RM4, to LB3 to match the tavern site and make it easier to redevelop. The city created the LB3 zoning designation in 2012 largely to meet the needs of E. North Ave. and a handful of other commercial corridors. Vangard’s project, for which designs are not yet available, is expected to meet the requirements for LB3 zoning and will not require a zoning variance. The project, because of its location, will require approval from the East Side Architectural Review Board. Jason Korb‘s firm Korb + Associates Architects is leading the project’s design. Haywood told the commission there is no commercial space planned for the five-story complex, but a first-floor lobby and community room will activate the street frontage. Both properties are currently listed as being owned by an limited liability corporation affiliated with former Judge’s owner Michael Lee. In 2015 the properties were listed for sale for a combined $1,075,000. Developer Brandon Rule had proposed a five-story, 58-unit luxury apartment building for the site in late 2016, but those plans did not advance. The project will next go before the Common Council’s Zoning, Neighborhoods & Development Committee. Demolishing Judge’s Irish Pub doesn’t make sense. One reason people come to the East Side is for the historic architecture and ambiance and quirkiness it creates. North Ave. is hardly recognizable any more, and not in a good way. You can find all the cheap looking buildings you want in the suburbs.